Now that a jury has convicted Boston Marathon bomber Dzhokhar Tsarnaev on all charges, even more is at stake in the next phase of the federal trial: The same 12 people must decide whether the 21-year-old lives or dies. Tsarnaev was found guilty Wednesday of 30 counts against him, including conspiracy and deadly use of a weapon of mass destruction. Seventeen of those charges are punishable by death. The verdict was considered practically a foregone conclusion since Tsarnaev's lawyer admitted he participated in the bombings. The former college student was found responsible for the deaths of three people who died in the bombings as well as the killing of a Massachusetts Institute of Technology police officer who was gunned down days later as Tsarnaev and his now-dead brother, Tamerlan, attempted to flee. Dzhokhar Tsarnaev was found guiilty on all counts in the marathon bombing trial, including the murder of MIT Police officer Sean Collier. In addition to the people who were killed, more than 260 others were injured when twin pressure-cooker bombs packed with shrapnel exploded near the marathon's finish line on April 15, 2013, turning the traditionally celebratory home stretch of the world-famous race into a scene of carnage. The defense lawyers, who barely cross-examined the prosecution's witnesses during the first part of the trial, are expected to become much more aggressive during the penalty phase, when they will make a case that Tsarnaev's life should be spared. 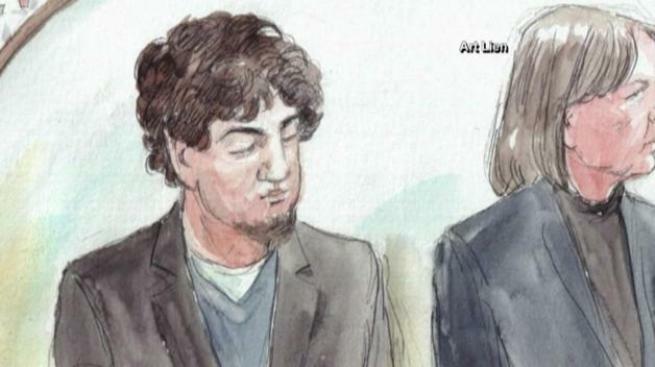 The defense gave a preview of its case during the trial when it insisted that the then 19-year-old Tsarnaev was strongly influenced by his radicalized older brother, who was said to have masterminded the attack. Tsarnaev's lawyers are expected to continue that theme, but also to explore the brothers' relationship more deeply and perhaps bring in evidence about Tsarnaev's life in Russia and the former Soviet republic of Kyrgyzstan, where the family lived before moving to the U.S. about a decade before the bombings. The defense can present any mitigating evidence it believes will persuade the jury that life in prison is the appropriate punishment rather than death. Legal analysts said they don't expect the defense case to contain any new revelations about Tsarnaev. "The crime is so horrific that they don't have much else really to point to, other than his age and the influence of his older brother," said Dan Collins, a former federal prosecutor who handled the case against a suspect in the 2008 terrorist attacks in Mumbai, India. Boston Marathon bomber Dzhokhar Tsarnaev was found guilty on all counts Wednesday, setting the stage for a possible death sentence for his role in the attacks that killed three people. "At this point, it's going to be the life experiences and the perspectives of the jurors in deciding whether or not they believe that these points are strong enough that his life should be spared," he said. Meg Penrose, a death penalty expert and professor at Texas A&M University School of Law, said it will be difficult for the jury to overcome the image of Tsarnaev planting a bomb just feet behind a group of children, including 8-year-old Martin Richard, who was killed. "I haven't yet heard all the mitigating factors you'd expect to hear. In traditional death penalty cases, it's physical abuse, sexual abuse, drug abuse, dropping out of school," she said. "In a crime of this magnitude, what American citizen wouldn't ask, 'What would drive a person to do this?' And, as a juror, the question becomes, what answer would satisfy you?" During the penalty phase, which could begin as early as Monday, prosecutors will provide evidence of aggravating factors they believe support the death penalty. They've already listed several aggravating factors, including the killing of a child and the targeting of the marathon because of the potential for maximum bloodshed. During the trial, prosecutors portrayed Tsarnaev and his brother - ethnic Chechens - as full partners in a plan to punish the U.S. for its wars in Muslim countries. Tamerlan Tsarnaev, 26, died when he was shot by police and run over by his brother during a chaotic getaway attempt days after the bombing. Survivors described losing legs in the blasts or watching people die. Martin Richard's father described making the agonizing decision to leave his mortally wounded son so he could get help for his 6-year-old daughter, whose leg had been blown off. Seventeen people lost limbs in the bombings. "I think the existence of other victims is an important point the government will emphasize," Collins said. "One of the aggravating factors that exists under the statute is the grave risk of death to additional persons, and showing that this bombing did have a widespread effect on other individuals is going to be one of the things they are going to point to." The jury must agree unanimously for Tsarnaev to receive a death sentence; otherwise the penalty will be life behind bars.